To celebrate tomorrow's premiere of ABC's "Shadowhunters" TV series – inspired by Cassandra Clare's Shadowhunter Chronicles young adult novels – I wanted to make a little something from the first book, City of Bones (from The Mortal Instruments series). There are many mentions of food in the story, plus food scenes, and food places like Taki's Diner and Java Jones, but I chose Jace's favorite dish because I get a kick out of his straightforward personality. Isabelle cast her eyes skywards. 'Yes. It’s in the kitchen.' "
For more recipes from City of Bones, check out Bryton Taylor's Coconut Pancakes, Not Your Mamma's Cookie's Faerie Plum Truffles, and Food Through the Pages' Apricot-Plum Smoothie. 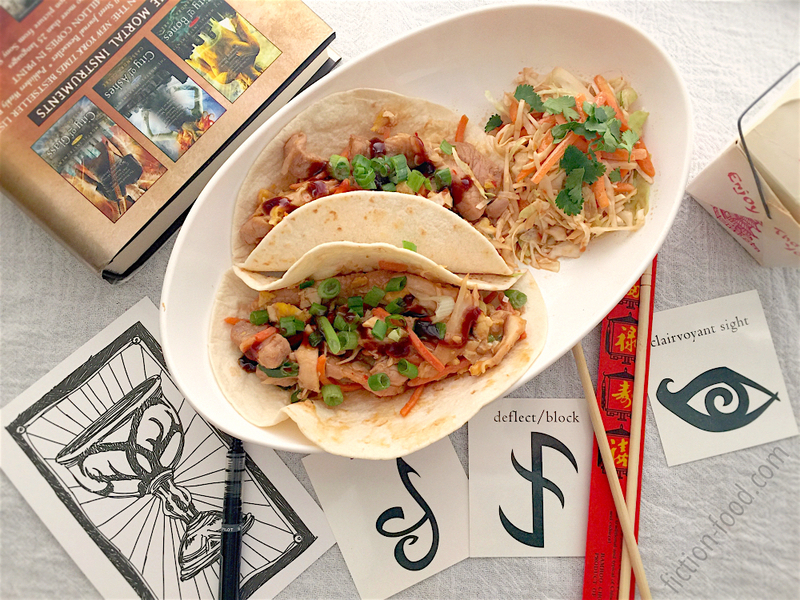 Have yourself a yummy "Shadowhunters" premiere party! 1. Whisk the sauce ingredients in a medium bowl until well combined & smooth. Add the pork & stir to coat, & then set the bowl aside for about 30 minutes. 2. Heat about 2 tsp. sesame oil in a large pan on medium heat & pour in the beaten eggs. Cook & scramble them & scoop them out into a large bowl. Dump the meat into the pan & cook on medium until no longer pink, stirring often, about 5 minutes. Remove from the pan into the bowl with the eggs. 3. Whisk up another amount of sauce. Heat 2 more tsp. sesame oil in the pan & then add all of the vegetables (excluding the lettuce, if you're using it) & cook for about 3 minutes, stirring often. Pour on the sauce & mix well & cook for another minute or so. Add the meat & eggs & stir to combine everything well. Cook for just a minute or so more & then remove from heat. 4. In a separate, small pan on medium, warm up one tortilla at a time, both sides. To serve, lay a tortilla or two on a serving plate & spoon a line of the mu shu mixture down the center. 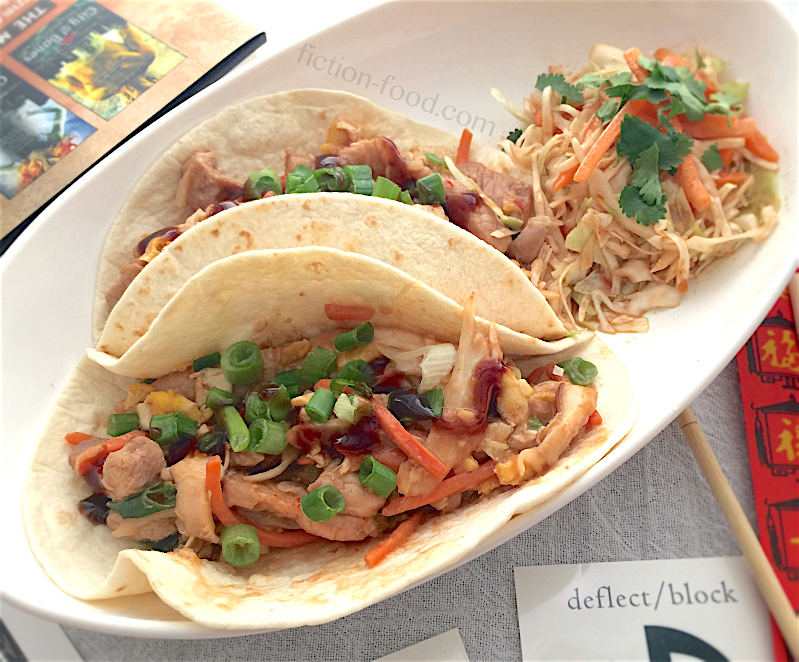 Garnish with extra chopped green onions, hoisin sauce, chili sauce, and/or fresh cilantro. (The salad on the side in the photos is simply raw shredded cabbage tossed with a little bit of the sauce). My "Shadowhunter" name is Headland. What's yours?